Alex Beard is an artist and puzzle designer. He recently spoke with LoveToKnow Board Games about his Impossible Puzzles and Untamed Games. Alex Beard (AB): I am a painter, a writer, a traveler, a puzzle designer, a lover of whimsy, an enthusiast and a businessman. I'm from New York City, but I live in New Orleans with my wife and two kids in a house uptown. I work in the French Quarter at my studio on Royal Street and spend my days making art. I get to do what I love in a place that I love with a wife and kids who love me. What could be better than that? LTK: What inspired you to create your games? AB: I believe there is a rift between the vast majority of the population and the art world that has been growing for years. The mutual connection between the artist and his audience has been fractured. It is my goal to re-connect that vital link by reaching out in as many ways as I can think of to bring fine art back into the mainstream and engage people's creativity. Games are a great way to have fun and get your mind clicking. LTK: What is unique about your Impossible Puzzles? AB: My puzzles are designed so that the pieces themselves are integral to the composition. Each piece is not a traditional jigsaw shape, but rather cut as a part of the art it depicts. Putting the puzzles together is more like assembling a mosaic. Pieces can be re-arranged into a composition other than the linear picture on the box. In fact, I run a contest where people can send in photographs if they have taken the pieces of my puzzle to make their own works of art. The photos can be uploaded to AlexBeardImpossiblePuzzles.com. Go to my website to see what other puzzlers from around the world have done with their puzzles. At the end of every year, I choose my favorite. As a prize, I make a work of original art based on the submission and send it to the winner. LTK: What is unique about your Untamed Games? AB: The Untamed Games are designed to inspire an understanding of different kinds of art in a way that is fun, challenging, and not too pushy. "Hexahedron" is a real wing dinger. 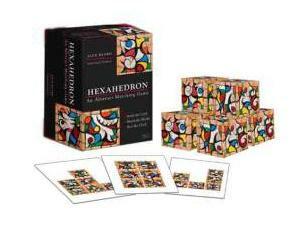 It is based on Abstract Expressionist paintings made specifically to be cut into cubes. "Face to Face" is a great way to introduce your kids to Cubism. Connect a nose to an eyebrow or a mouth, but never a nose to an eye. Play it like Dominoes and watch unique Cubist portraits emerge. LTK: Where can our readers view your artwork? AB: Go to AlexBeardStudio.com or visit me in my New Orleans Gallery at 712 Royal Street on the corner of Pirate's Alley. Alex Beard interacts with children. LTK: Where can our readers buy your games and puzzles? AB: You can go online to my website, or you can go to Borders, Barnes and Noble and many independent stores around the country. LTK: Where can we read more about you? AB: Go to the "In the News" section of my website AlexBeardStudio.com and AlexBeardStudio.com/press and read copies of articles from Publisher's Weekly, Vanity Fair, The Wall Street Journal, and many more.